Built to accommodate the diverse needs of the community, these 6' and 8' all-steel utility tables are popular for many indoor and outdoor applications. Most commonly used as service and event tables, they are also ideally suited to function as universal access picnic seating. The all MIG welded, powder-coated 2-3/8"O.D. 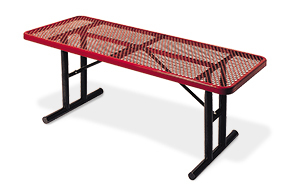 frame provides superior support for the highly durable steel table top. With an ultra-resilient polyethylene finish these utility tables provide versatile, low maintenance surfaces that are ready to preform where and when they benefit the most.